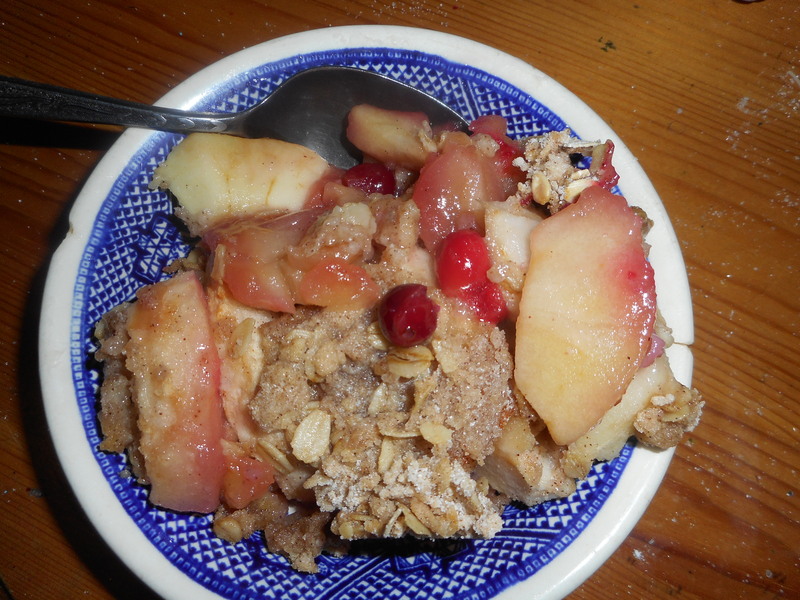 Apple Cranberry Crisp is Awesome! 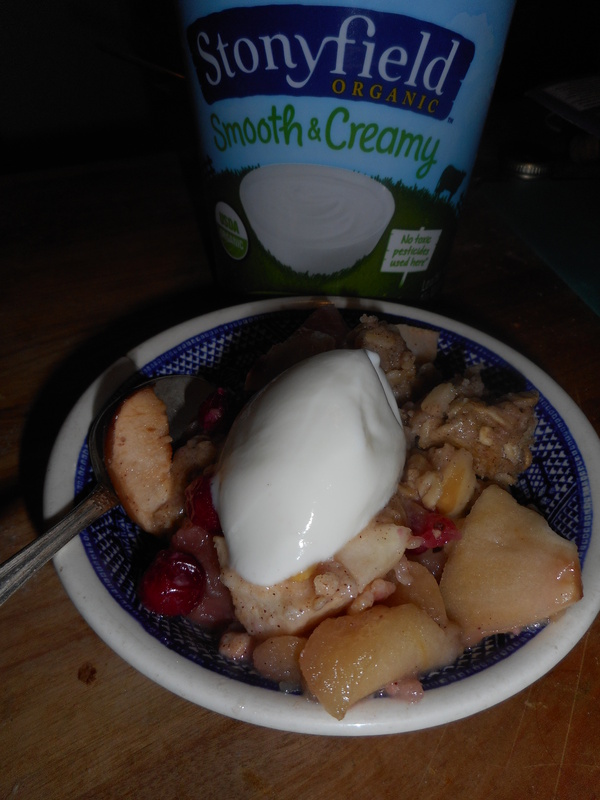 Apples are the heart of this recipe but the cranberries add snappy flavor to it and some great color. If you can, get organic as the sprays they use on growing apples are not good for you. 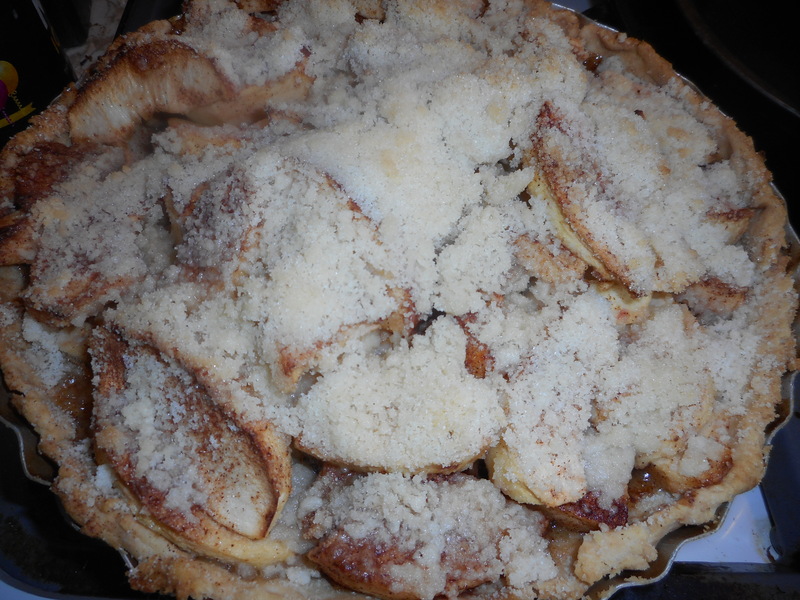 I made this last weekend with some golden delicious apples from a local orchard. South of Hellertown is Bechdolt’s Orchard which grows many apple varieties. Go there if you want the freshest tastiest apples in this geographic area. 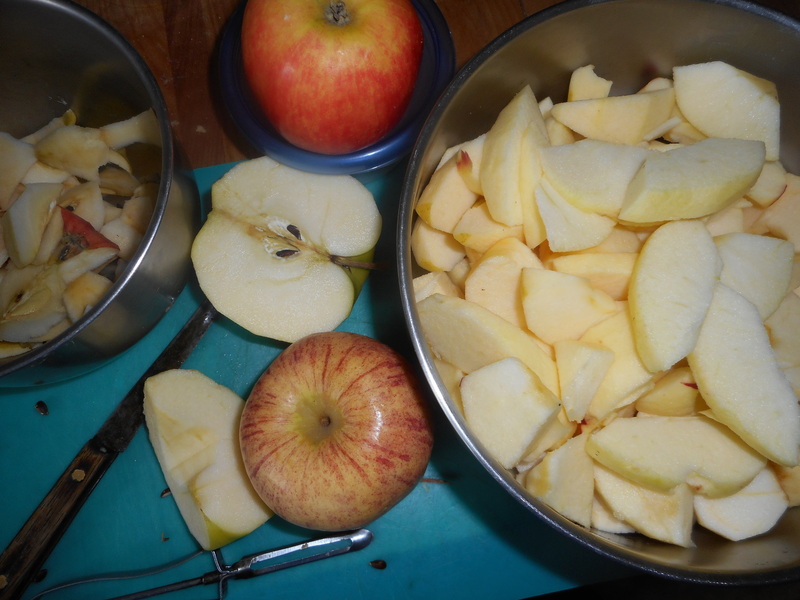 The variety is up to you but I would not suggest red delicious as they are for eating only. This recipe is out of Gluten-Free Baking Classics Cookbook by Annalise G. Roberts with a few additions. Her flour mix appears to be identical to that of King Arthur Flour’s gf mix. I am betting you can use any GF flour mix in this recipe, not like a cake or other baked goods that have very specific flour requirements. I have made this recipe several ways. But it works best in the melted version below. I have made it egg free but it really somehow needs that egg to pull it together to mimic a wheat flour based crisp. 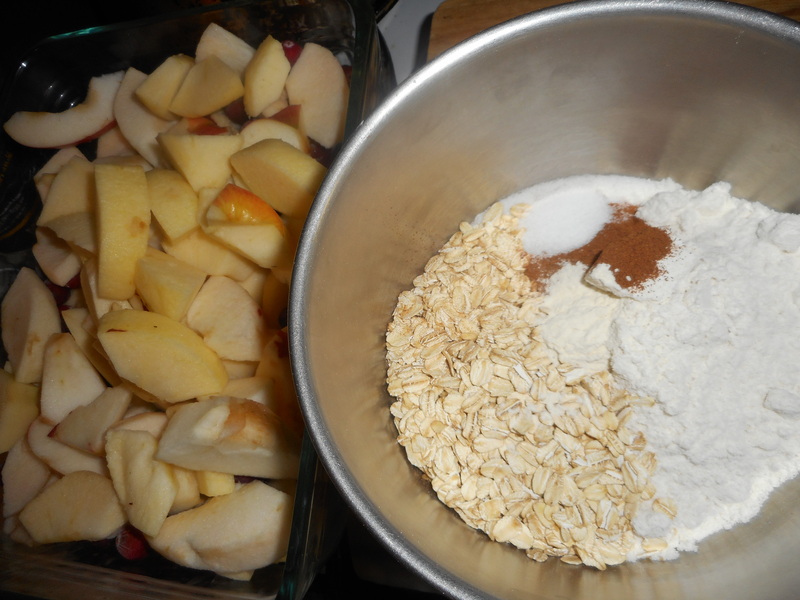 The oats can be left out if you don’t like them. I personally love oats in my crisp. I don’t like it too sweet so I use the lesser amount of sugar. This is entirely a personal choice. For those who love a topping and want to go low fat, this recipe is absolutely perfect with a big scoop of lowfat plain organic yogurt on it. 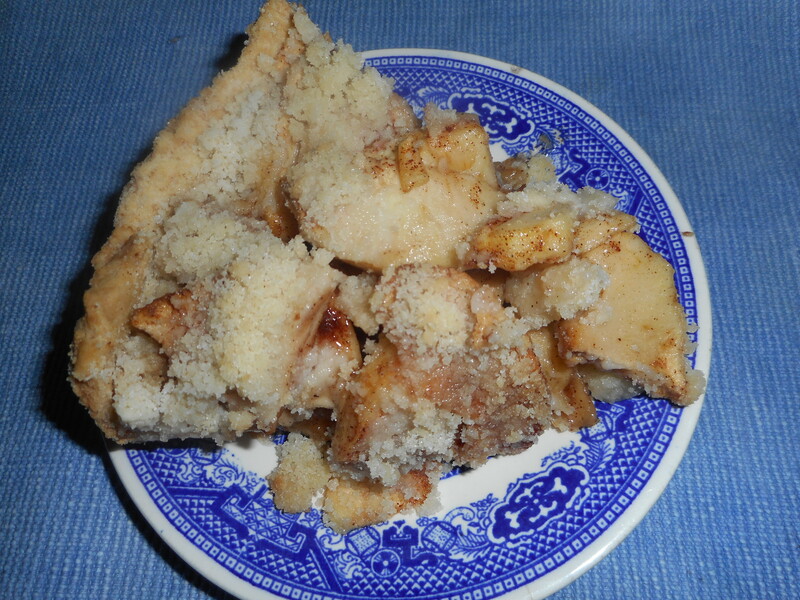 I love crisp warm from the oven but it also is tasty cold the next day, if you have any left over that is! Combine all the dry ingredients. Add egg and stir to mix well. 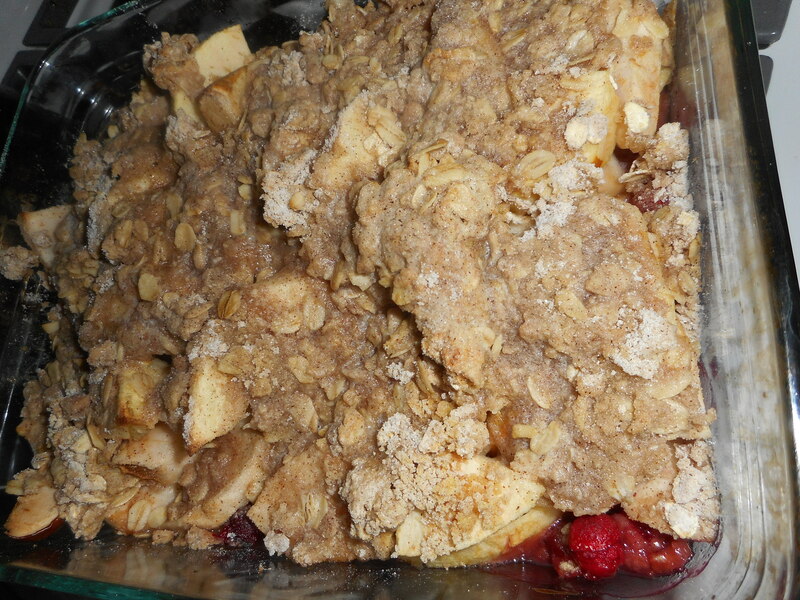 Place half the apples in the baking pan, top with cranberries and then the rest of the apples. Sprinkle with the dry mix and sprinkle with the melted butter. Bake 40 minutes until bubbly and the topping is browning. 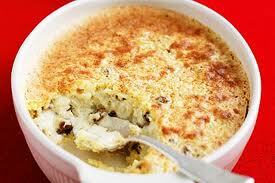 I always loved rice pudding as a child, creamy custard studded with raisins and topped with a good sprinkle of cinnamon. But the rice itself was kinda drab. A few years ago, I found a recipe that caused a rice pudding revolution in my kitchen: it used sweet rice which is a white short grain oriental rice. You could substitute Arborio rice if you like. I buy this rice in oriental grocery stores but I think Wegmans may carry it too. Each grain absorbs the milk as it cooks and releases a lot of creaminess as well as providing a soft squishier rice that gives the pudding a more blended feel than my mom’s usage of long grain rice that stayed firm and separate from its pudding surrounding. This recipe is naturally gluten free. No one eating it will think, “Oh, darn, another of those weird GF recipes!” They will just think, “I wonder if she will think I am piggy to want seconds of this? I think in a pinch you could skip the second part where you briefly bake the pudding but I never do, I think it helps the pudding form the best texture. 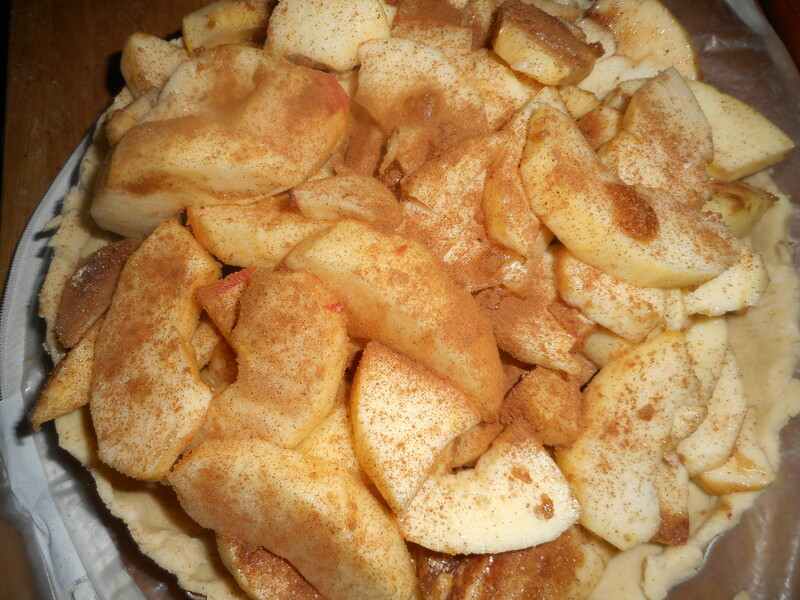 Do sprinkle the top with cinnamon unless it is something you despise. I recommend whole milk as it makes pudding taste so good but if you prefer two percent that will work. I do not recommend skim milk for pudding. Ick on the texture and flavor of such a mutant pudding! And this recipe is great with chopped dried apricots, dried cherries, golden raisins, or even currents or in it instead of raisins. My original recipe had lemon peel and apricots in it. Recently I put a few long orange peelings in it and a cinnamon stick while it cooked on the stove top which gave it a delicate orange flavor which played well with the raisins. So, you can alter it to suit your mood and your ingredients. This snowy weekend adds more really cold days. What could be more comforting after a chilly time shoveling than a bowl of wickedly creamy homemade rice pudding? 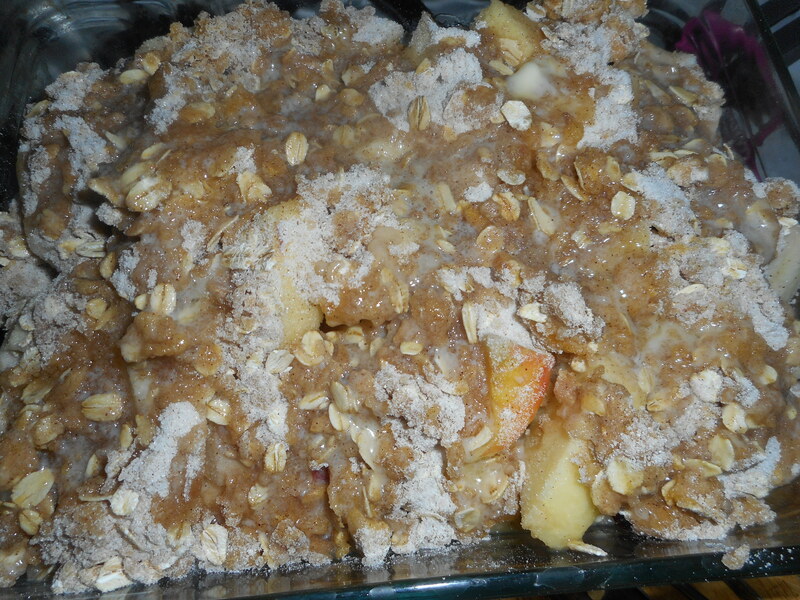 1/3-1/2 cup granulated sugar, this depends on your sweetness needs! Rinse the rice in a strainer briefly, place in a heavy bottomed 1 ½ quart saucepan, pour in the milk (4 cups) and stir frequently as it heats on medium to a bubbly simmer. Add the raisins and turn down the heat to low, cover and cook 25 minutes. Be sure to stir it every 5-9 minutes to separate the rice and keep it from scorching on the bottom. Add the sugar, stir well. Mix up the egg yolk and whole eggs in a bowl with a whisk and add in some of the hot mixture; maybe 1/3 to ½ cup. 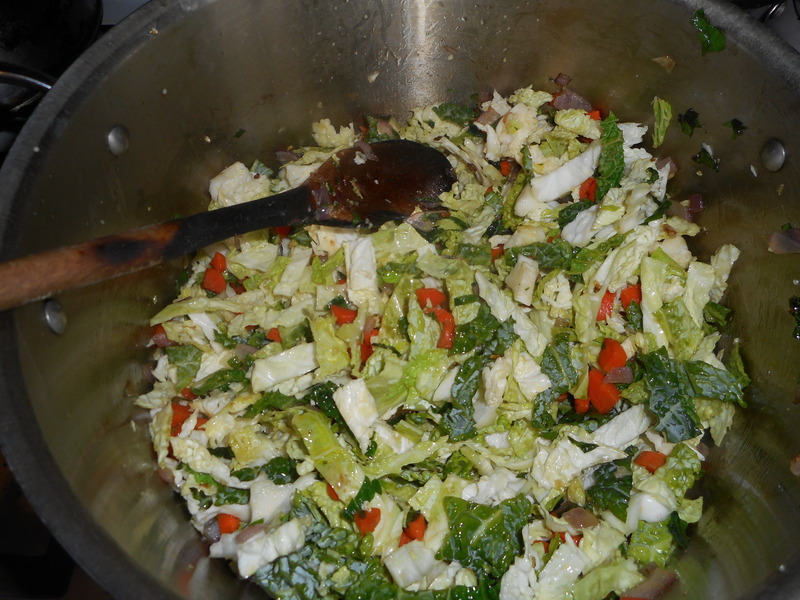 Dump it all back in the pot and stir well. Turn off the heat and add the vanilla. Heat your oven to 300 degrees. Butter the bottom and sides of a low ceramic or glass baking dish. I like an oval myself, that shape is what my mom usually used! 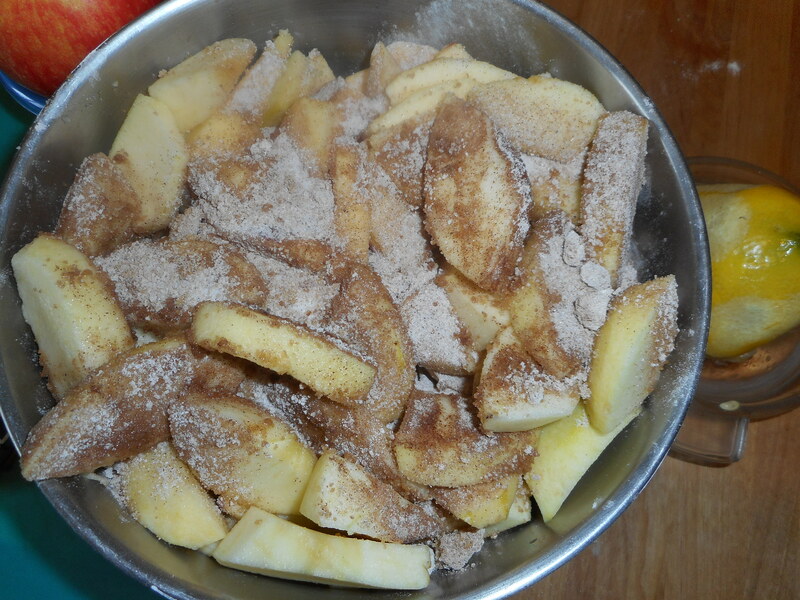 Pour in the pudding, removing any lemon or orange peel and the cinnamon stick if you used such and sprinkle it well with cinnamon to dust the surface. Bake for 20 minutes. Sometimes I put it in a hot water bath created with a 9×13 cake pan and some hot tap water. This can produce lovely delicate custard if you don’t mind the extra fuss. 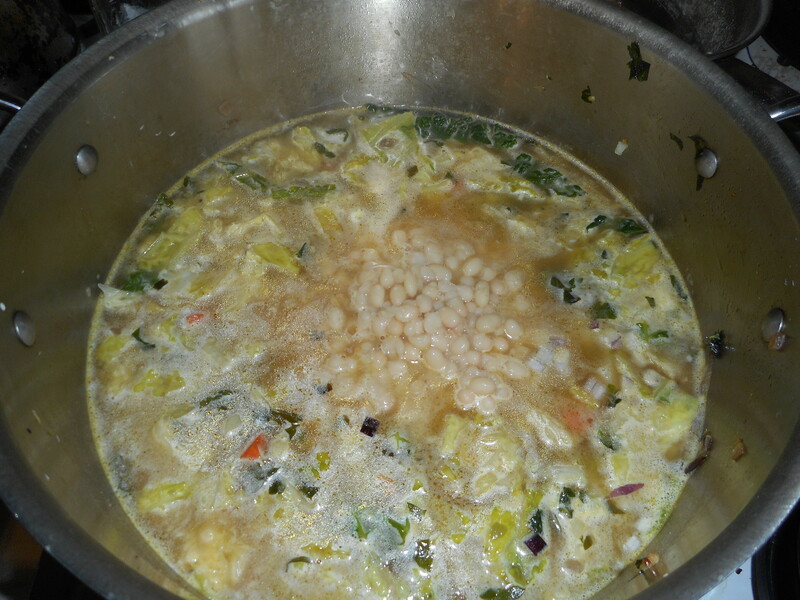 It is tasty warm and wonderful the next day. Some people guild the lily with toppings of whipped cream, grated lemon or orange peel or even whipped mascarpone cheese. Up to you how you dress it up! I occasionally serve a homemade cookie on the side for added crunch value. Enjoy! Chicken Paprikash, Its For Supper! Burrrr it is cold, too cold for anything but comfort food. If you have ever had chicken paprikash at Elizabeth’s Diner here in Hellertown, you know it is really tasty. I was very sad when I had to give up their mouthwatering paprikash for my new gluten free life. Thinking back, I liked the dark meat version but their white meat was also yummy. Still, what was important was the little dumplings and sauce: Best. Ever. tiny dumplings and great sauce, rich and flavorful. Gosh I miss it. So…no more eensy weensy dumplings but maybe some day I can have the chicken paprikash? A few months ago I got this new cookbook; “The Everything Gluten-Free Slow Cooker Cookbook” by Carrie S. Forbes. Everything I make is delicious. 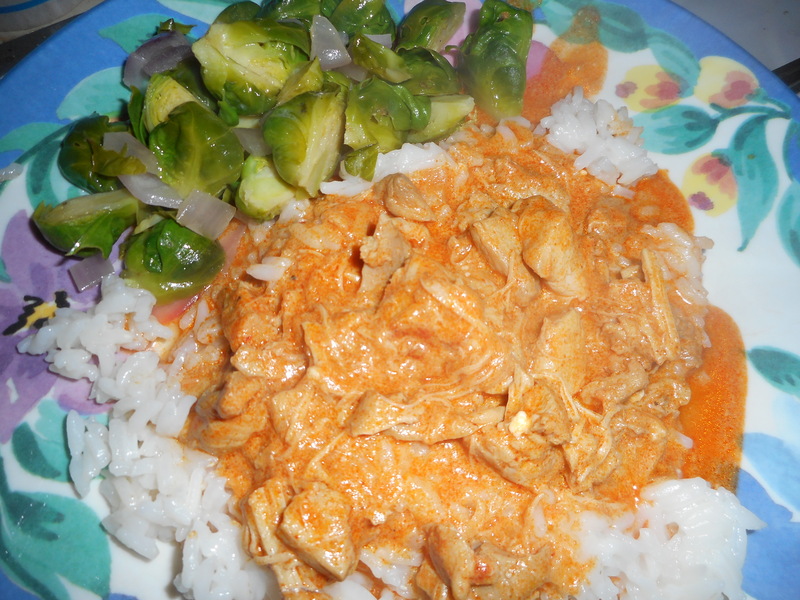 This chicken paprikash recipe I am sharing, I have made it both in a slow cooker and on the stove top. So I added directions for both versions. You can use full fat sour cream but it works fine with a name brand light sour cream. Do not use non fat; it won’t taste like it should. I like both Daisy and Breakstone brands of light sour cream. I have had it with white rice, brown rice and with gf noodles. All yummy. All easy. Just add a vegetable or salad and you have a well balanced, tasty gf meal. This picture, was taken the meal I enjoyed it with some brussels sprouts sauteed with shallots, garlic and some olive oil. Great combo. 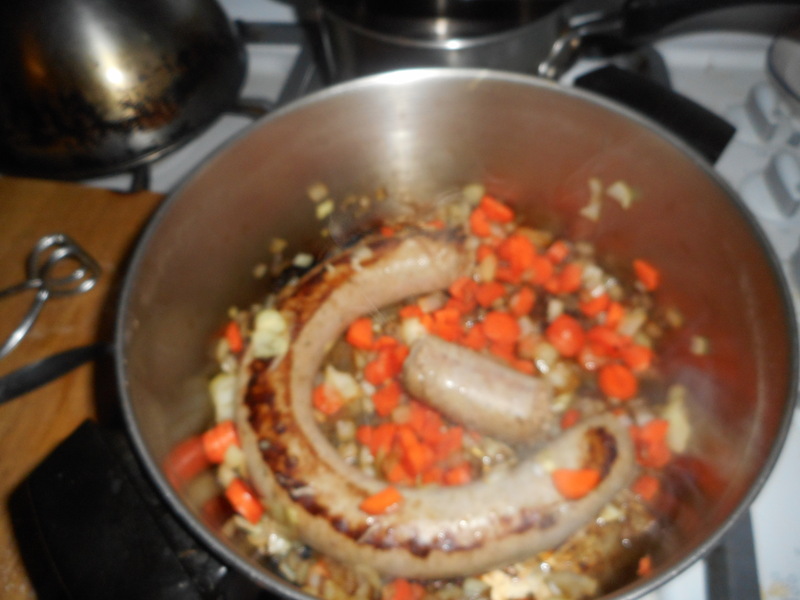 In a large sturdy sauce pan add the butter and EVOL, heat, add onion and cook 3-4minutes, add garlic and cook 1 more minute. 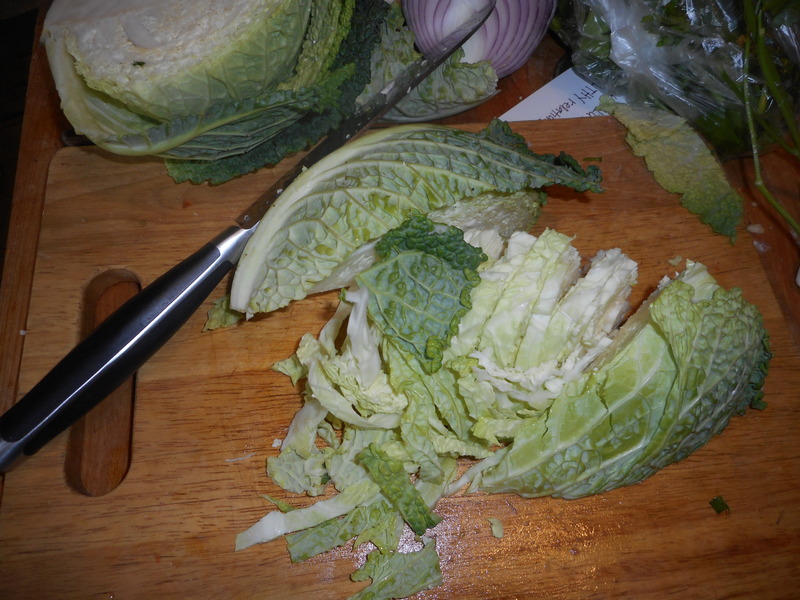 Put in slow cooker or leave in sauce pan if you are doing it stove top. Cut the raw chicken thighs into bite sized pieces; ½-1 inch chunks. Add to slow cooker or sauce pan. 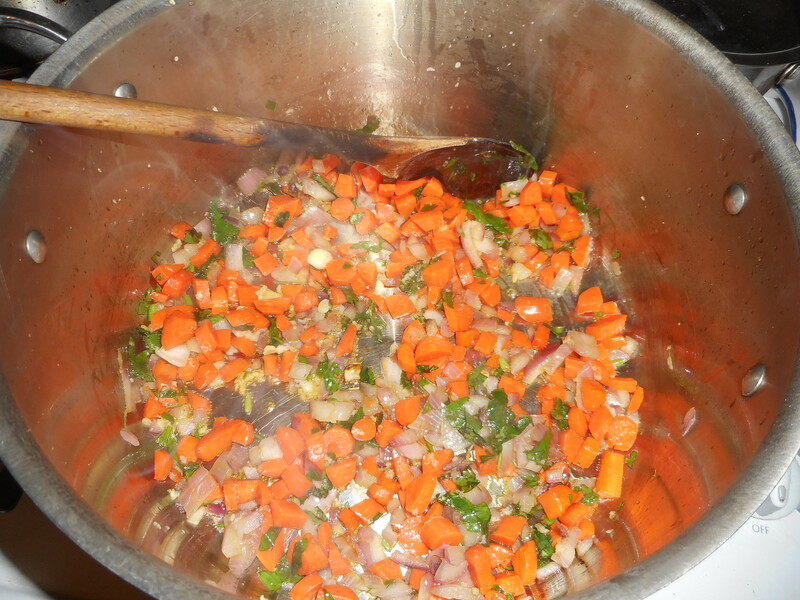 Stir and add the salt, pepper, paprika, chicken broth and wine, cover and cook on high 3 hours, or low 6 hours. Or 45 minutes on low in covered saucepan. For the stove top version stir it every 10 minutes and add more broth if it gets dryish. Stir in the sour cream, cover and cook 15 minutes on low on stove top or 30 min more in slow cooker. Serve over your choice of starch. The sauce is divine; can sprinkle extra paprika on it when you plate each serving but I never need to do that. The chicken comes out so tender; great both done in slow cooker or on stove top. 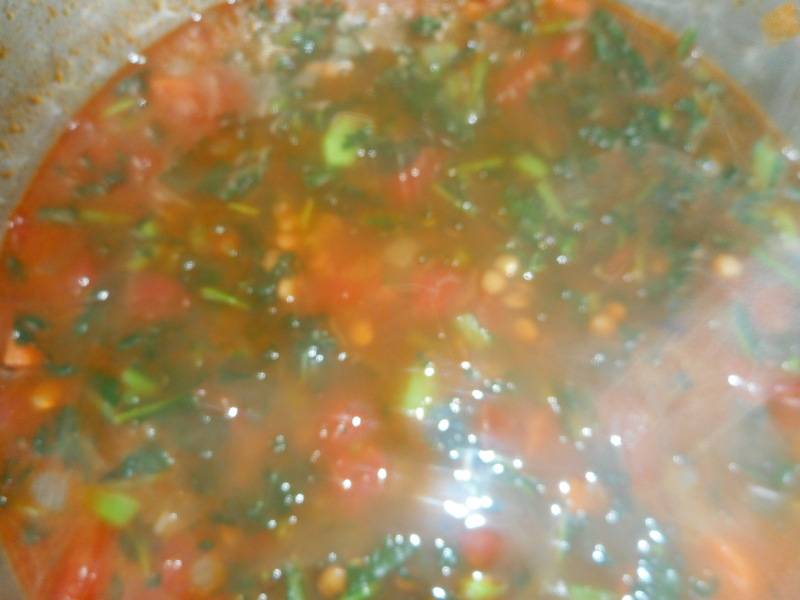 Do use a thick bottomed sauce pan; I have a double bottom one I like for such things. 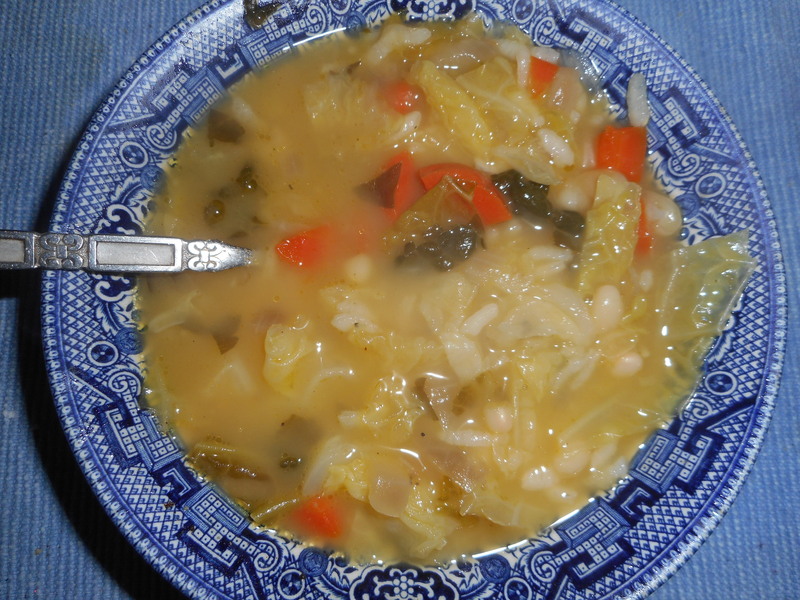 Great winter fare and fairly healthy. Enjoy! Happy Fastnacht Day! How ever you spell it; there are several versions out there: also spelled Fasnacht, Fausnacht, Fauschnaut, or Fosnacht. Anyway, today is Shrove Tuesday which is Fastnacht or donut Day in Pennsylvania. 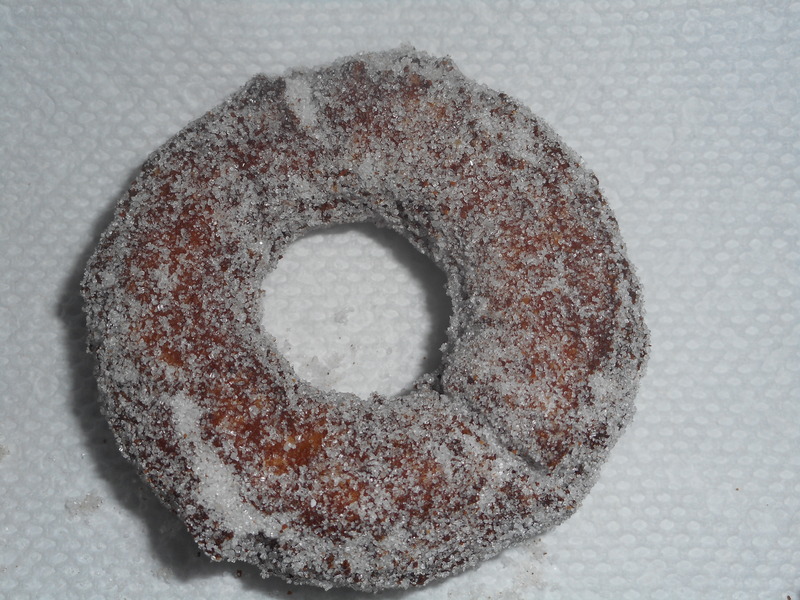 A true fastnacht has some potato in it and the texture should to be light yet substantial and moist. It can have a hole or not but no filling or fancy sprinkly crazy donut flavors. It is a basic old school donut and people around the Lehigh Valley love them. I can guarantee you that hundreds, no thousands, of fastnacht donuts are being munched on as I type this! I pretty much gave donuts up a number of years ago and only ate them on Fastnacht Day. They are so fattening and oinky plus I never eat many so making a batch, even a half batch, used to leave me with a lot of donuts to give away. When I went gluten free exactly 2 years ago today I gave them up totally. It wasn’t the biggest food sacrifice I made (there are too many choices for that award to even mention here!) but I do miss that treat on this special day. Yesterday I looked at recipes, wanting to find a donut recipe for which I had the ingredients and could make within the time frame of the day, meaning no 12 hour to 2 day rise recipes. The best looking and sounding recipe had just that; a minimum twelve hour rise. Nixed it and went for a version that was made from extra flaky buttermilk biscuit dough. No yeast, no rising. Some freezing and a lot of folding and rolling was part of the deal. No sweat, just make sure you have two cups of the special gf pastry flour recipe made up plus some for sprinkling on your bread board. I can’t share the recipe; created by Nicole Hunn of Gluten Free on a Shoestring fame, she does not allow recipes of hers to be shared in blog posts like mine. You can get it right from her website: http://glutenfreeonashoestring.com/gluten-free-biscuit-donuts/. The dough goes together fairly easily. 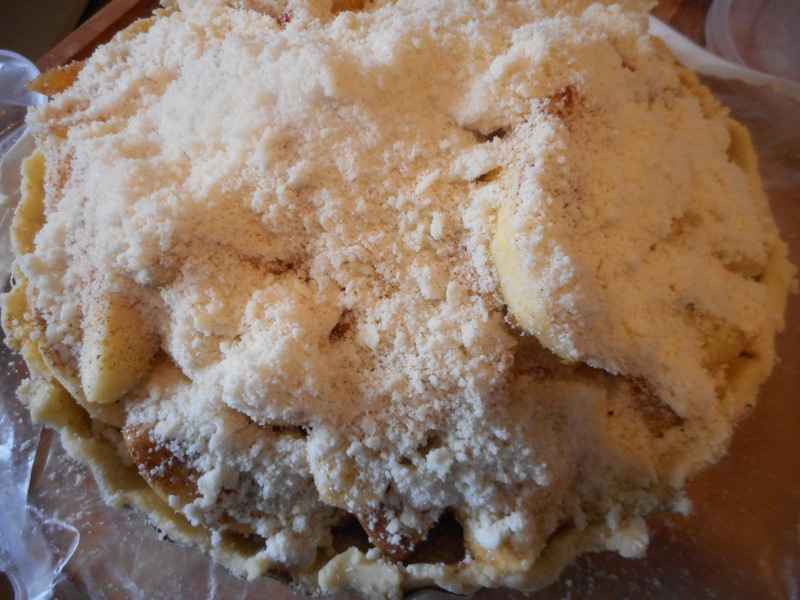 I found it best to use my pastry cutter to blend in the flour properly. 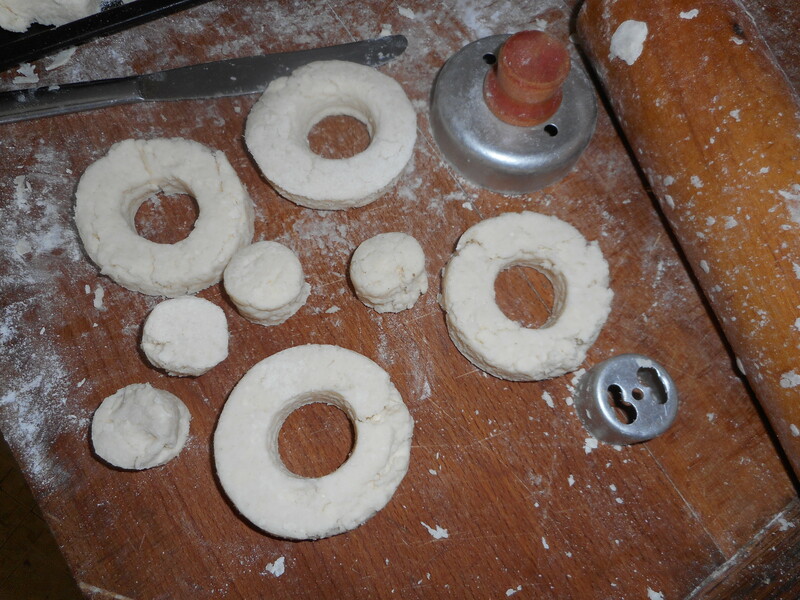 I froze most of it rolled and cut into round and rectangular biscuits for later use. I only made 4 donuts and 4 donut holes. Containing my donut possibilities down to something manageable! I probably should have smoothed my dough more; it is a bit craggy, reminds me of sour cream cake donuts…. Next time…. 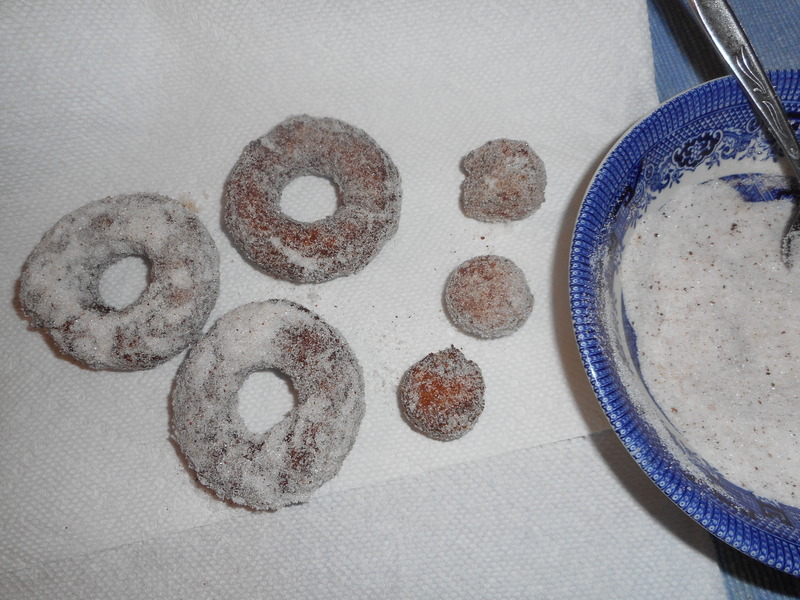 I made one change to my donut finishing; I added a good sprinkle of nutmeg to the granulated sugar and thus gave them some of the flavor of my mom’s lovely yeast donuts. Next Fastnacht Day I will create Nicole’s yeast raised donuts – just have to plan a few days in advance so her amazing dough has time to organize itself properly in the cold raising phase in my fridge. Do check that recipe out in her book, Gluten-Free on a Shoestring Bakes Bread, along with many other tempting breads. It is not too late to whip up a batch of oinky donuts that are gluten free and yummy. Happy Fastnacht Day to all my donut loving friends! Time for my fastnacht!